Those of you that have read any of my previous stuff on UK companies, whether it be on here or Seeking Alpha, have probably realised that I like talking about pub companies. For somebody that generally writes about higher quality businesses this might seem a bit strange. After all many pub companies have been notoriously tough long-term investments. That said there is a small group of around four pub stocks that are worth a closer look at the right price. I have covered two of these – Greene King and JD Wetherspoon – on here before (as well as on Seeking Alpha). The other two are the historically family owned groups: Young & Co.’s Brewery and Fuller, Smith and Turner. I will cover both of these in the next two articles, starting with Young’s. Founded in the late 19th century Young’s operates pubs and inns across London and the south of England. Though it still retains the word “brewery” in its name it actually disposed of its beer producing operations a few years ago and is now a pure play pub company. As it stands the estate totals 251 properties of which around 70% are managed and operated directly by the company. The remainder are tenanted, with Young’s acting as a property company collecting rents and operating a tie on alcoholic drinks (i.e. occupants are forced to buy their beer, wines and spirits from Young’s). Of the roughly 180 managed properties that make up its estate, 23 are inns offering accommodation. The lion’s share of the company’s profit – approximately 90%-95% – is generated by the managed pubs/inns division. One other thing worth pointing out before we start on the business is that Young’s has a dual share-class structure stemming from its history as a family controlled enterprise (the Young family still own a chunk of the voting stock, though not an outright controlling stake). The voting shares (LON:YNGA) currently trade around 25% higher than the non-voting stock (LON:YNGN) and they are also the more liquid of the two. The non-voting shares rank pari-passu in economic terms (e.g. dividend distributions) but only the ‘A’ shares confer the right to attend and vote at shareholder meetings. Now let’s move on to the business, which in my view has two important things going for it. The first is that its estate is very concentrated in some of the most affluent parts of the country. Its pubs are mostly present in the wealthier parts of London, but the company also has a presence in well-off counties such as Surrey, Oxfordshire and Gloucestershire. Having relatively wealthy patrons is obviously a good start for a consumer orientated business, but the other thing to bear in mind is that around 75% of the estate is owned freehold (meaning Young’s owns the land as well as the pub/inns that sit on top of it). The upshot is that the balance sheet is loaded with valuable real estate that can help prop up the share price in the event of a downturn. As of last October the total value of the company’s property, plant and equipment came to just under £700 million net of accumulated depreciation, much of which is in the form of prime London real estate. The other thing to like about Young’s is that the pubs themselves also tend to be quite upmarket ones (you can see this for yourself by checking out the company’s website). This is important given that they still rely more on selling drink than on food (sales of food represent around 30% of managed pub/inn revenue). The major problem with a wet-led strategy like this is the huge price disparity between pubs and supermarkets when it comes to alcohol. At its most extreme I wouldn’t be surprised if a pint of a well-known lager brand in a London pub was over three times more expensive than the equivalent ‘per pint’ price in a supermarket. Having upmarket pubs located in similarly upmarket areas seems to me to be a good strategy for attracting new patrons, including tourists, while ensuring previous ones are more likely to return. Okay, so that was a brief qualitative assessment of the Young & Co’s estate, but what about the actual numbers? Do they support the idea that its pubs and inns are on the higher side of the quality spectrum? The answer to that question seems to be a cautious yes. As I mentioned above, selling beer in pubs seems to be a fairly grim business proposition these days. Not only is it now much more expensive than in supermarkets, but the average UK consumer hasn’t been in particularly great financial shape for a while now. Unless your pub has something going for it (whether it be offering decent food, a nice building, great location or whatever) it is probably difficult to grow profits. A rough guide to the health of a pub estate is therefore to simply check the like-for-like growth figures for selling drink. 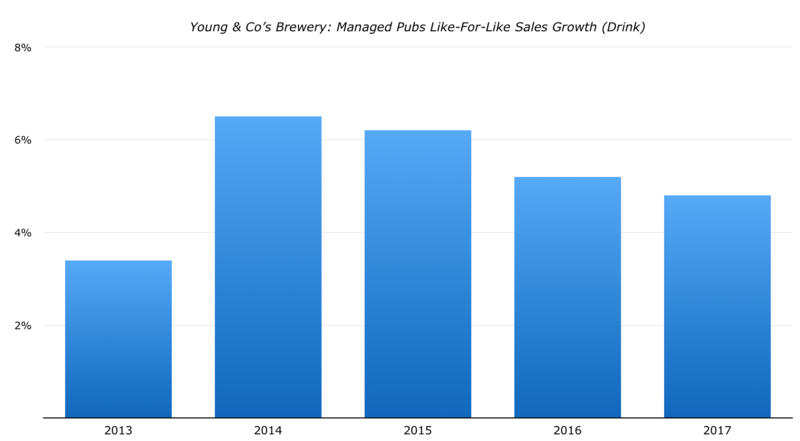 As you can see Young’s has actually managed to post some very respectable growth figures over the past five years, which is a good sign that the estate is in decent health. Another good guide, applicable to any business really, is to look at the underlying cash flow. If a company’s assets need lots of money spending on them in order to maintain sales then there won’t be much left over for shareholders at the end. Pubs and restaurants usually fall into this category, though Young’s is surprisingly cash generative. 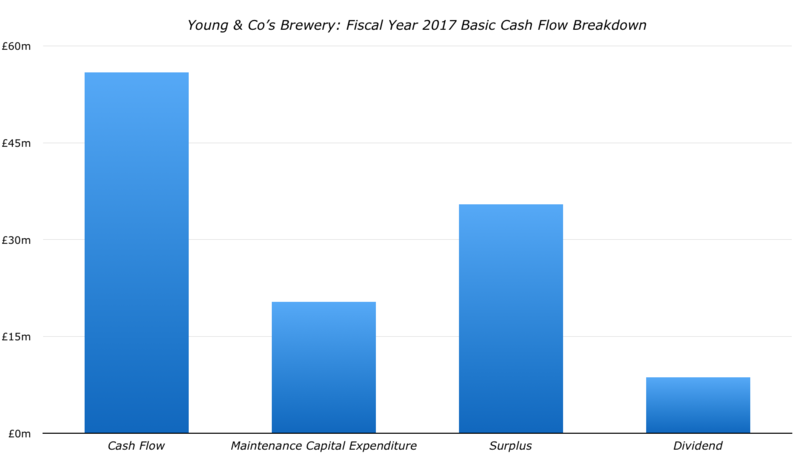 Over the past couple years its maintenance capex bill – which I estimate using the depreciation expense on the income statement – has been comfortably below half of the net cash generated by its pubs/inns, leaving plenty of surplus cash left over for things like dividends, debt repayment and buying new pubs. Speaking of debt the balance sheet is in good condition, with the £120 million or so net debt pile coming in at under 2x annual EBITDA. The annual interest bill is also a very comfortable 10-12% of operating profit. That said there are downsides to even the best pub companies. The major one, applicable to all of them, is that they generate low returns on capital because they are very asset intensive businesses. In this regard Young’s doesn’t really appear to be that much different: over the past five years headline return on capital employed has only averaged around 6% or so. 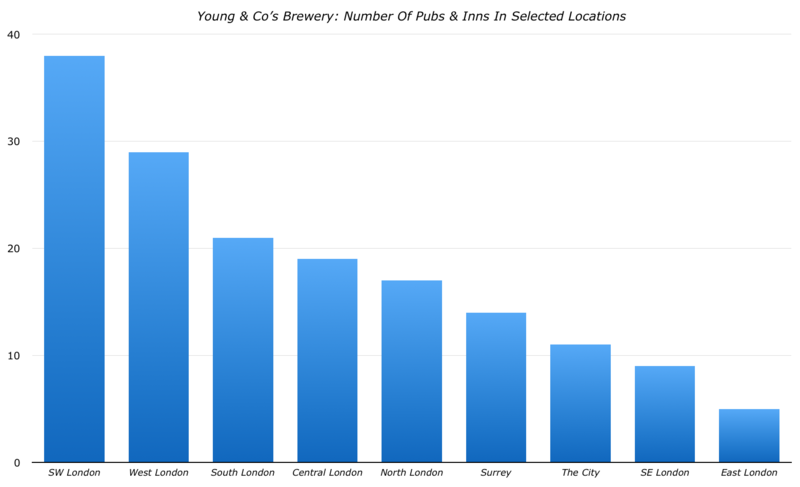 Though Young’s is definitely one of the better pub operators its shares are also quite expensive. Net asset value per share currently stands at around £10.50 versus a share price of £15.50 for the voting stock. As good as Young’s is for a pub company paying 1.5x book value seems pretty expensive to me. On an earnings basis things don’t look too much better either, with the shares currently trading at over 20x estimated 2018 profits. Granted, Young’s has managed to grow its earnings per share at a compound rate of around 13% per annum over the past five years – itself a fantastic achievement – but that will be near impossible to replicate going forward. In any case paying well over 20x forward earnings at this stage of the business cycle seems far too much. Investors would be better off waiting for a downturn before buying into what is undoubtedly one of the best pub companies in Britain.